A fresh new Layers Theme Extension for adding amazing effects to your website contents. This is basically an enhancement of the Layers Theme default extension called “Content” that allows you to add stunning animations to text, images, etc. It already comes with 54 effects made using TweenMax library and with a very clean and user-friendly interface. This plugin is an Extension of Layers, a brand new WordPress site builder very easy to use. Take a look at www.layerswp.com. 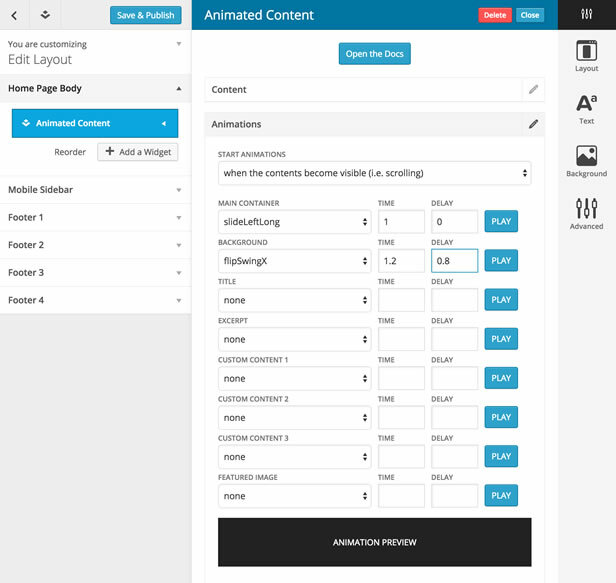 Animated Content already comes with 54 ready-to-use animations. Each widget instance is placed on your page as a row. Inside it you can place some texts or html, an image, choosing a background, setting css styles and managing the layout. You can then apply an enter animation to each content item, choosing your preferred effect, the duration and the delay, allowing you to create an animation sequence. It’s also possible to choose when the animation starts (when the row become visible while scrolling, after the html page has been loaded or when all page contents have been loaded). And, as each Layer Theme Extensions, you can see a real-time preview!